Back when we were looking for a house to buy for the very first time, I did a bit of research about what to keep in mind while looking. You know, check faucets, mould, reticulation etc. We already knew we wanted a quiet street or cul de sac, a garage and a shed, space for a veggie garden and at least 3 bedrooms. What we didn't know to look for, and I didn't come across anything about this in my research, was north facing houses. Our house is west facing, and obviously, you can't always have north facing but the house could be designed to fit the block. In our house the master bedroom is on the south west corner so gets a bit of afternoon sun. The main living area and kitchen are on the east side, and the east and south sides of the house have a big verandah running around them so they get absolutely no sunlight and are always quite dark, even though there are a lot of windows. The main bathroom, one spare room and the laundry are on the north side and get beautiful natural light and warm sunshine. Totally useless! It really is my biggest regret about buying this place. It's like we live in a igloo all Winter. Thankfully, MR pruned the big bush outside our bedroom window yesterday so the afternoon sun can get in and warm it up and I'm lying on my bed typing this at 4pm without the need to be in pyjamas, uggies and a dressing gown, my usual household attire. Luckily, at the end of the year I'll (hopefully) be moving to a house that is filled with beautiful natural light and warmth and is a big long north facing rectangle. Thank goodness! What's your biggest regret about your home purchase? Same. Not enough light gets in... especially in the winter. 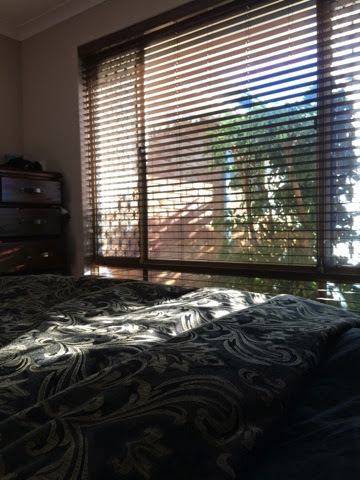 In the summer I'm kind of thankful about it... but what I have realised is that it is much easier to get block out curtains to stop sun getting in than being without it all together in the winter. I wish we had a garage rather than a carport too. ... and a fully equipped art studio. The front of my house gets the full blast of the sun which means you cant stand outside for more than 3 seconds in summer or you'll burn your eye balls out! Maybe you could add some skylights for more light? Light paint colours and furnishings might help too.